As a teenager one starts to discover its musical taste. One of the bands I discovered in the eighties were the Talking Heads. I’d be lying if I called them my favourites, but I did enjoy listening to their music, taped several of them and really appreciated ‘Stop making Sense’. Later I found out that they had been around for a while. The singer of that band seemed a tad eccentric. But also sympathetic and talented. Many years later and after often relistening ‘once in a lifetime’, I bump into a book of his. At the travel section of the bookshop even. It appeared that Byrne almost always travelled with a bike. When performing somewhere, he’d take a few extra days and discovered a city the best possible way. He even wrote about it. And blogged. Many considered it worth a book so one day a lot of his stories were printed together and hence the book. Having read the book, I’m glad he did publish it. Because even as an avid blogger, I like to read longer pieces on paper. 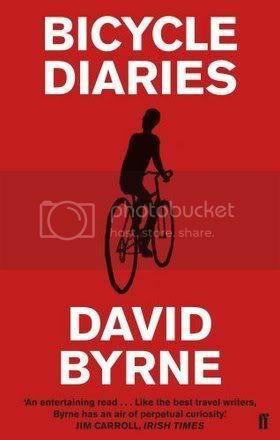 The bicycle diaries follow Byrne across the world in mundane places like Berlin, Sydney and London, but also to less predictable places as Manila, Buenos Aires and Istanbul. And he certainly follows his own agenda. It is great to discover places through his eyes. He sees things the average tourist will miss. Apart from that being an artist, he meets plenty of interesting characters. But also the cities I know myself (Berlin, London, Sydney) seem like new cities to me, which makes this book even better. Gradually one also notices that Byrne becomes an expert on cycling in cities and has to give talks about the subject. Meets professors who need his help and politicians who want him on their side. Not your ordinary travel book I’d say, but certainly not one to be missed.